The EU has a 27% target for renewable energy in 2030. This means, in practice, a target of 45% renewables in the electricity mix. This ‘revolution’ in renewables cannot be left to develop without a blueprint. It has to be a revolution by design to ensure it will be smooth, safe and cost-effective. A thorough analysis of the consequences of a high share of variable generation for the European electricity system is critical to ensure its economic and technical viability. 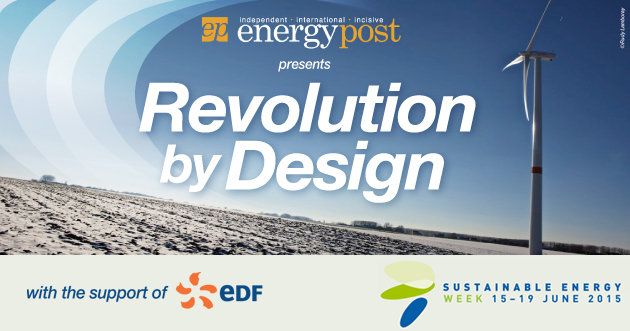 Energy Post, with the kind support of EDF, Europe’s largest utility company, invites you to discuss the latest challenges and possible solutions at an evening debate forming part of the programme of the EU Sustainable Energy Week (EUSEW). EDF has conducted an in-depth study which analyses what a 60% renewable electricity share means for the European energy system. Until now, this has only been used inside the company for strategic purposes. To mark this year’s EUSEW forum, EDF has agreed to share its findings to stimulate this crucial debate. Alain Burtin, Deputy Director Energy Management Programme, EDF R&D, will take you through some of its key aspects giving stakeholders an exclusive insight into what may lie ahead. Our panellists will debate the study’s implications and take questions from delegates. See below for more information on our speakers and panellists. If you have a stake in how the revolution needs to be managed then come and debate it at this official EUSEW event. Register Now – places are free but strictly limited so save the date in your diary and reserve your seat. Following the debate you will have the chance to network with your colleagues, the panel and organisers at a complimentary cocktail reception. We look forward to meeting you there so Register Today and secure your delegate pass. Many thanks to our speakers and presenters. Diego Pavia is CEO of KIC InnoEnergy since 2010. Beforehand, he was CEO of Atos Origin for Spain and South America. This serial entrepreneur has created 7 companies to-date. His first start-up Knowledge Engineering dealt with industrial controls systems. He graduated as electrical engineer (electronics & automation) from the Polytechnical University of Madrid. Alain Burtin is Deputy Head of the Energy Management Programme at EDF R&D,in which role he directs prospective studies on the energy system and develops methods and tools to optimise EDF’s gas and electricity portfolio. Between 2003 and 2007 he was Head of Market Analysis and Asset Development in EDF’s Optimisation and Trading Division. He has also worked on international business development, investment project analysis, European market integration for EDF Energy, UK, and software development for the operational management of electricity systems and investment and pricing decisions. Augustijn van Haasteren deals since 2003 on energy issues within the European Commission. Within DG Competition, he worked on enforcing the EU antitrust rules in the energy sector and vetting energy mergers and acquisitions under the EU merger regulation. In 2013, he joined DG Energy’s unit in charge of gas and electricity wholesale markets, where his responsibilities include Greece, Romania and the electricity market design initiative. Kristian Ruby is a widely recognised expert in sustainability communication and political affairs. Before joining EWEA, he worked as journalist, consultant and also served seven years as a public servant in the Danish Ministries of Environment, and Climate and Energy and in the cabinet of the former European Commissioner for Climate Action, Connie Hedegaard. Dimitri Pescia is Senior Associate European Energy Cooperation (France, Belgium, Luxembourg) at Agora Energiewende think tank in Berlin. He worked for the Department of Economic Affairs at the French Embassy in Berlin from 2008 to 2013. Prior to this, he worked as a scientific policy officer for the French Ministry of Foreign Affairs. He holds a Master of Science in Physics from the Swiss Federal Institute of Technology in Lausanne (EPFL) and an Imperial College London International Diploma. Michel Matheu is currently Head of EU Strategy at Electricité de France (EDF). Before this he worked in the field of regulation of electricity systems for 10 years. Previously he was Head of the Department in charge of Public Utilities and Environment at the Planning Office, an advisory body to the French Prime Minister. He has also had an experience of research and consulting at the Ecole Polytechnique in Paris and of editing journals published by the French Ministry of Industry. Pascale Fonck is Head of Market Committee, ENTSO‐E. Head of the division on Public and Regulatory Affairs and European Activities at the Belgian system operator Elia. Working there since 1999, she has gained extensive experience on EU market integration projects and regulatory affairs. Chairperson of ENTSO‐E Market Committee since 2013. She has a PhD in applied mathematics from Liège University. Hughes Belin (MODERATOR) has been a Brussels Journalist on energy/climate issues for more than 15 years, he contributes to French daily newsletters Enerpresse and Bulletin de l’industrie pétrolière, the EU policy broadcaster ViEUws.eu and the energy online media EnergyPost.eu. He also worked for FT energy newsletters, Platts, and Europolitics. He was awarded the 2007 Louise Weiss Prize for European Journalism. *Please note that all fields are required to be completed accurately. Failure to do so may result in your registration being unsuccessful.